This product requires the base game Far Cry® 5. 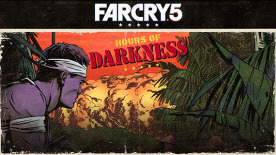 Wreak havoc behind enemy lines in war-torn Vietnam in Hours of Darkness, the first DLC for Far Cry® 5. Your mission is simple: Escape, free your squadmates, and get revenge. Features a harrowing story of survival, a unique map, new weapons, skills, and more! Experience all-new Far Cry gameplay as you relive the experiences of Hope County's resident Vietnam veteran. Vietnam Sandbox: Navigate a deadly jungle, rescue squadmates, defeat enemies to reach the extraction point. New Weapons and Skills include airstrikes and all-new stealth-based Survival Instinct feature. New Game Modes: Complete Hours of Darkness to unlock new Survivor and Action Movie modes.